An offer they can’t refuse (usually!) – For many tasks (turning off the TV, putting a toy away, getting dressed) it can be helpful to be clear with your child that either he can complete the task, or you will do it for him. This strategy reinforces children’s natural desire to act independently by giving an opportunity to complete a task on their own. Here is an example of what that can look like. If a child declines to do the task even after you count to three, there’s a good chance she really needed your help, and you need to follow through with your offer. When this strategy is implemented consistently, it won’t be long before you get cooperation without having to go through all of the above steps. Logical consequences- When a task must be completed but the parent shouldn’t or can’t do it for a child (such as homework, cleaning the child’s room, or asking for something politely), a good option is to lay out the expectation with the promise of some positive event after the task is complete. For example, “First do your homework, then we can read together.” Be wary of your child pleading with you that he “can’t do it!” or “doesn’t know how to.” If you are truly confident that your child can and must do the task on his own, then stand firm and express that confidence to your child. Often we get buy in to a child’s low self-esteem and thereby reinforce it. A child’s ability to struggle through the demands placed on him is incredibly beneficial, and sometimes what he needs most is a parent’s belief and encouragement. You show that best by allowing him to protest and then confidently waiting for him to rise to the challenge. Get a job! – Kids love to be able to exert their power, in positive ways when possible, and in less helpful ways when necessary. A child’s resistance to completing tasks may be merely an attempt to exert power. So use the energy behind their wish to have power and direct it in a way that can help the family. 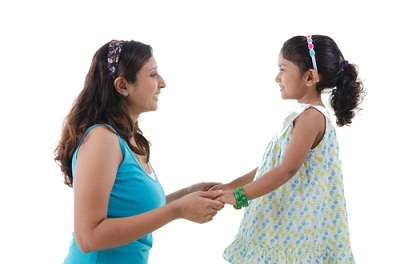 Check in with your child about what she might like to do to help the family. Yard work? Bringing the trashcans to the curb? Loading the dishwasher? You might be surprised what she comes up with and just how proud she is when she’s done a job. Having a job can go far in helping a child feel she is a valued member of the family. That feeling reinforces the impulse to cooperate in the future. Natural consequences – Allowing the “natural consequences” of children’s behavior to take place can be a powerful tool to help a children to improve their cooperation. For example, if a child is responsible for placing his dirty clothes in the laundry hamper, then not washing the clothes that are strewn around his room would be a natural consequence that can help prod a child to change his behavior. Another example would be allowing an older child who has failed to complete a school project by the due date to deal with the consequences without parental intervention. As long as the consequences do not endanger the child, allowing natural consequences to unfold can be a powerful tool for behavioral change. However, this strategy requires parents to allow events to unfold – including the child’s disappointment, failure, or temporary discomfort – without stepping in. It’s not always clear initially which approach or combination of approaches to take with your child, so some trial and error may be necessary. However, with a little time, firm and clear expectations, and support from a partner or other adults, your child will see that cooperation and the feeling of belonging that comes with it can be its own reward.